As I’ve said before, I think that most freelance translators (and really, people in general) need to have more fun. So, the sole purpose of this post is to tell you about something I did that was fun, and to explain where I was during my July-August hiatus! You can also read previous off topic posts on my travel A-Z, my 40th birthday trip to Costa Rica and llama trekking and making sugar skulls (not at the same time, although the llamas probably would have liked to eat the skulls! This post will mostly appeal to bike geeks, so feel free to skip it if you’re bored! This summer my family spent two months in Europe, partially for my husband’s job and partially to do a bike trip. You can hear more about it (and about freelancing on the road in general) in a Speaking of Translation conference call here. I need to write up some thoughts on my experience freelancing from Switzerland; it worked out very well overall, but I have some specific tips for anyone thinking of taking their business abroad. In the meantime, let’s talk about the fun part…riding bikes from Lake Geneva to Salzburg, which we did at the end of my husband’s consulting gig. Q: Who was on this trip? A: Me (age 40, somewhat in shape); my husband (age 46, legs of steel); my daughter (age almost 10, little legs of steel). Q: What bikes did you ride? A: My husband and my daughter rode our Burley Duet tandem road bike, and I rode a single titanium touring bike that we ordered from XACD Titanium Products in China. Here’s me, somewhere in the foothills of the Dolomites! Q: How did you get the bikes to Switzerland? Q: How far did you ride? A: Almost exactly 1,000 kilometers, so about 600 miles. We rode 14 days, took 3 rest days and then stayed in Salzburg for 4 days. A: Yes! And actually, my daughter complained much less than I did…seriously. We never really biked toured before my daughter was about 7 and we got our first tandem, and now I actually think it’s a fabulous activity with kids as long as you have a very strong adult to captain the tandem. For example I cannot captain our tandem on hilly/mountainous terrain because I can’t pedal it fast enough. Tandems have a higher minimum speed than a single bike, meaning that you have to pedal a lot harder/faster to keep a tandem upright. So not every adult is well-suited to captain a tandem, but my husband and my daughter love riding ours. Also, it’s worth noting that not everyone who loves to bike tour is cut out for “stoking,” aka riding the back of a tandem. I love bike touring and I kind of hate stoking because you have to pedal at the same rhythm as the captain and you have no brakes or steering. So don’t set off on a 3 week trip with a stoker who’s never done it before. Q: How did you carry your stuff? A: In paniers (bike bags) on our bikes. We stayed in hostels or bed and breakfasts and did not camp, so we didn’t have a ton of stuff. Plus, when touring in Central Europe, one really does not need to carry a huge amount of food because there’s a town every few kilometers. When touring in Colorado we sometimes have to carry an entire day’s worth of food and water. For example when we did Trail Ridge Road, the uphill took me six and a half hours (I warned you, I’m slow!) and there is no place to buy food or even refill your water. On this trip, other than the longer pass crossings, we rarely went more than an hour without going through a fairly sizable town. A: Oh, now that’s hard…there really was no worst part, other than the hotel we booked in Bolzano that turned out to be up the side of a mountain. But they were understanding when we called to cancel, and we found a great hotel right in the walking district. And you know the stories you’ve heard about how expensive Switzerland is? They were probably understatements, and I have a $27 bottle of sunscreen to prove it. Switzerland is gorgeous, but the beauty doesn’t come cheap. Just ride fast toward Italy, which is considerably cheaper, and you’ll be fine. Mostly we felt very lucky that in three weeks, we had only one day of rain. We’ve talked to bike tourers who had the opposite conditions, and during the month we were in Switzerland, it rained at least a couple of days a week. So we felt fortunate! Here are the stages that we rode. I’ve included some minimal route notes, and if you’re thinking of doing a similar trip, you can contact me directly and ask questions! Day 1: Leysin to Sierre, Switzerland. 106 kilometers, 6 hours riding. Mostly on the Rhone river towpath, which is harder to follow than you would think. Train from Sierre to Fiesch, Switzerland. Day 3: Fiesch to Hospental, Switzerland, over the Furka Pass. 63 kilometers, 6 hours riding. It’s steep! Just put your bike in low gear and crank up those intestinal switchbacks! Day 4: Hospental to Rhazuns, Switzerland, over the Oberalp Pass. 88 kilometers, 7 hours riding. Not as steep. Day 5: Rhazuns, Switzerland to Chiavenna, Italy, over the Splugen Pass. 80 kilometers, 8 hours riding. Loooong day. Looong climb up the Via Mala gorge including several extremely dark tunnels. Do not attempt this section without good lights. Ride together if you are in a group. Splugen Pass is fairly exposed and committing. Allow a lot of time and save some energy for the white-knuckle downhill into Chiavenna which involves more tunnels on a gravity-defying road! Day 6: Chiavenna, Italy to St. Moritz, Switzerland, over the Maloja Pass. 50 kilometers, 6 hours riding. Steady uphill until the very end of the climb, then crazy uphill. But then a nice coast into St. Moritz! Day 7: St. Moritz, Switzerland to Santa Maria, Switzerland, over the Ofen Pass. 75 kilometers, 7 hours riding. Don’t even get me started on the “up and down” aspect of the Ofen Pass, but the ride through the Swiss National Park is incredible. Day 8: Santa Maria, Switzerland to Bolzano, Italy, 120 kilometers, 6 hours riding. Mostly downhill on bike paths through the highly scenic Val Mustair to Merano, Italy, then another downhill bike bath from Bolzano to Merano. Not as hard as 120 kilometers sounds. Day 9: Rest day, Bolzano. What a cool city!! Don’t miss the Otzi the Ice Man museum!! 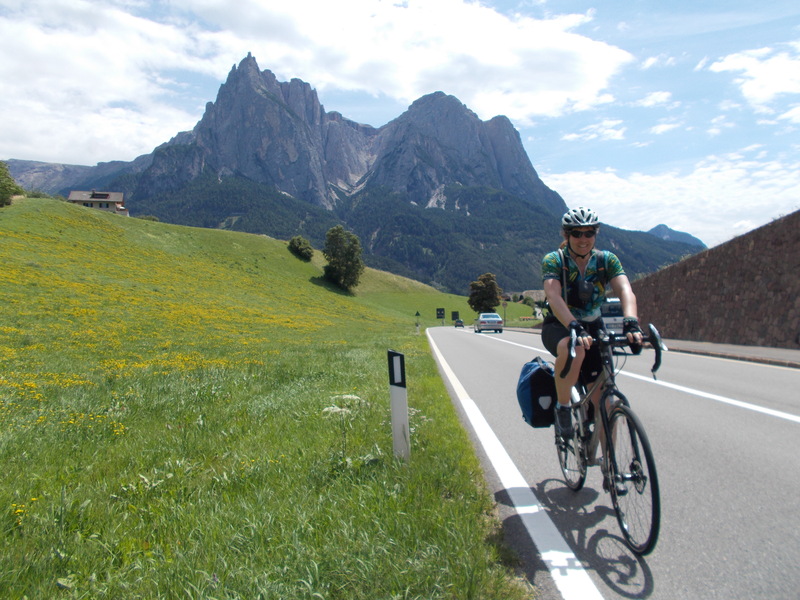 Day 10: Bolzano to Selva Gardena, Italy. 46 kilometers, 6 hours riding. Nice rolling ride into the foothills of the Dolomites. Gelato!! Day 11: Selva Gardena to Caprile, Italy, over Passo Sella and Passo Fedaia. 7 hours riding. This might have been our favorite day; the scenery is just incredible if you’ve never seen the Dolomites before!! More gelato!! Day 12: Caprile to Cortina d’Ampezzo, Italy, over Passo Giau. 39 kilometers, 7 hours riding. Giau is steep, and it’s one of the standard stages of the Giro d’Italia. But you’ll have plenty of company, maybe more bikes than cars! 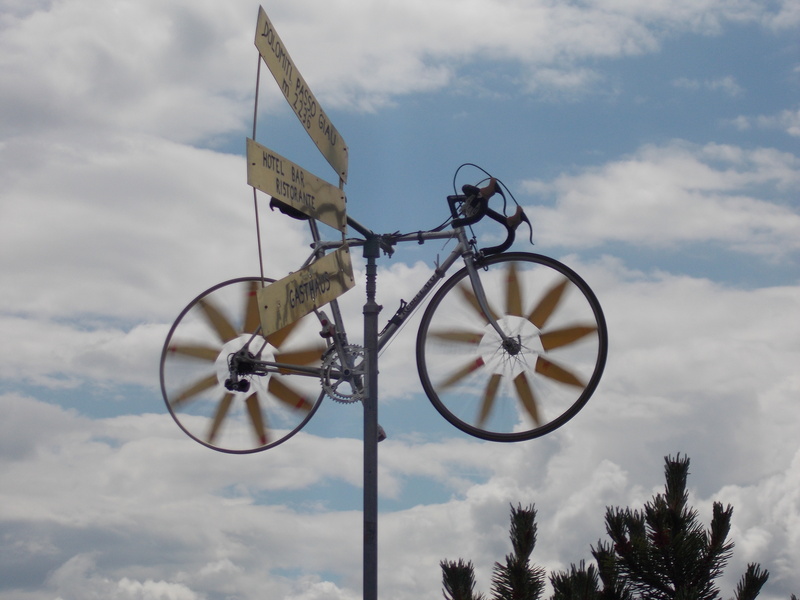 And at the top there’s this cool weather vane! 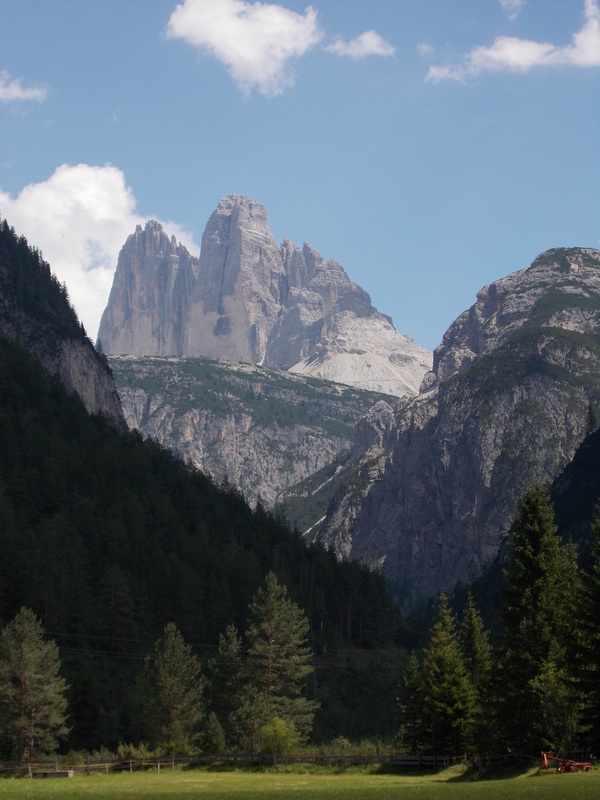 Day 14: Cortina d’Ampezzo to Dobbiaco, Italy. 30 kilometers, 3 hours riding. This is all on a bike path and is slightly uphill then slightly downhill; mellow day. Day 15: Dobbiaco, Italy to Heiligenblut, Austria. 90 kilometers, 8 hours riding. This starts out on a bike path and is all downhill to Lienz, Austria. Then the fun really begins as you cross a small mountain (Islesberg), lose all the elevation you just gained, then regain that elevation and more on the bike path to Heiligenblut. Day 16: Heiligenblut to Zell am See, Austria, over the Grossglockner Pass. 57 kilometers, 7 hours of riding. This was our only rainy day, and probably the hardest climb of the whole trip. The Grossglockner High Alpine Road is a great ride, but with a sustained 12% grade, it’s a thigh-buster! Also be aware (which we weren’t) that the pass is a double summit: up to the highest point, down a few hundred meters, back up to about 3 meters below the highest point, and then down the other side. Day 17: Zell Am See to Lofer, Austria. 42 kilometers, 3 hours riding. A nice, mostly downhill cruise on a bike path. Day 18: Lofer to Salzburg, Austria. 51 kilometers, 4 hours riding. Another nice, mostly downhill cruise on a bike path. We took the Mozart Radweg from Lofer and somehow ended up lost in Berchtesgaden, Germany, picked up another bike path and did finally end up in Salzburg, so if you do this route, be aware that it’s not totally obvious where the main bike path goes! This was our first bike trip in Europe; an incredible experience that we can’t wait to repeat! Wow I am so impressed! reading your post generates such feelings of a well organized and well planned trip. 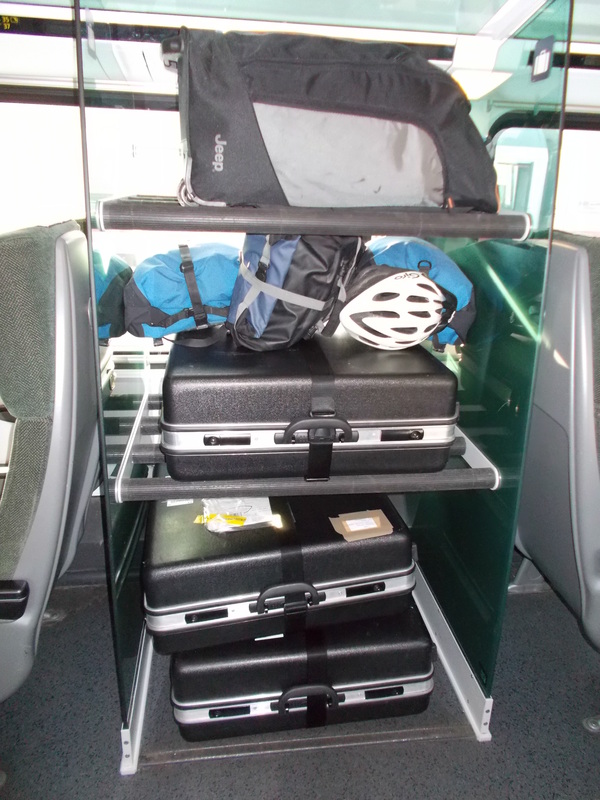 The bikes in the suitcases in the train, unbelievable! This sounds like such a great experience! It is amazing of your daughter to have done it too! How you managed to keep the momentum of working in the middle of it all, I wonder!! Loved your post! Thanks Marie! Yes, it was an incredible trip! Also, I should say that I didn’t work at all while we were on the bike trip. I checked e-mail in hotels a couple of times but did not take a computer. I’ll talk about that in my ‘working from abroad’ post! I have always wanted to do a bike trip. I love the idea of going on vacation and staying in shape at the same time. Did you also learn some new European/Swiss French terms to take back with you? Thanks for your comment! Yes, being able to stay in shape on vacation is definitely great. I mean, I’m up for a beach chair and an umbrella drink too, but active vacations really are fantastic. Fortunately Swiss French is pretty standard (unlike Swiss German), but it took me a while to get used to the numbers (septante, huitante, nonante)! But fortunately the Swiss speak relatively slowly and clearly compared to other French speakers! Sounds wonderful. I never knew you could pack bikes like that. Very nifty! Thanks Tess! Yes, believe it or not we got the tandem on Craigslist with the couplers already on it. Definitely the way to go for a travel bike! Wow Corinne, that sounds amazing. I’m completely in awe! Thanks Caroline! It was a great trip! Glad to know you enjoyed the Dolomites, they are such a spectacular area, in winter too! Coincidentally, the BBC published a video today on South Tyrol (or Alto Adige, as we call it in Italian), which shows the Ötzi museum, Bolzano and some views of the Dolomites. In the end they show what they say is a typical dish, spaghetti+dumplings, but in my year-long experience in the area, I’ve never seen them being offered on a menu together, let alon eaten! Thanks Klaudia! Oh my gosh, I can’t believe that you live in Zell am See! We should have talked about that when we ran into each other in JFK (not that I could really move by the time we got to Zell am See, but it would have been fun to see you!). Have a safe trip back! Furka. Oberalp. Splugen. Maloja. Ofen. Santa Maria. Gardena. Sella. Fedaia. Giau. And you consider yourself “somewhat in shape”? I’m sure the passes are even more beautiful by car, because you can actually breathe enough to see the sights! Before we left, I joked to my husband that the only phrase I really needed to know in Italian was “Non posso respire”! And I guess I consider myself “somewhat in shape” for Colorado, where everyone else is doing Ironman triathlons, which I will never do because open water swimming is my worst nightmare… Thanks for your comment! For those of you who did not yet know this, now you do: Corinne and family are athletic superstars! My parents DROVE up the Grossglockner and my mom thought THAT was steep and scary. I’ve said it before: I am in awe of your athleticism and organizational skills! Respect Corinne! From a tandem rider who also does cycling holidays, but not for so long…If you are after new ideas for cycling tour in Europe, I would recommend the Inner Hebrides in Scotland, especially if you want to add some wildlife watching at the same time as cycling is great to enjoy nature. One of my best holidays: cycling through several islands with a hopscotch ferry ticket. Just have to be lucky with the weather! Very interesting posting as we also want to take our daughter in a year or 2 on the tandem and I would have to do like you and follow on a bike. Thank you for sharing your experience! That sounds like an amazing trip. A friend of mine cycled from Barcelona to her home town in Poland last month and she really appreciated the fields of southern France, but you can’t beat the Swiss mountains! I was recently in Switzerland but only had the time and funds to travel as far south as Kandersteg and Grindelwald, so I never managed to see the Matterhorn-style mountains on the southern Swiss border. You were definitely VERY lucky with the weather though! I’ve been in the Scottish Highlands very often (I live in Central Scotland) and it’s rained practically every time, and the Swiss mountains are higher still.